Maroon is a neutral, I swear. A summer-weight dress of maroon tropical wool. The bodice is lined in white linen, and even with a layer of wool and a layer of linen, it's so lightweight that you can see shapes and outlines through it if you hold it up in front of a window or other light source. The wool itself is semi-sheer when backlit. The dress is worn over a linen chemise, my working stays, and at least one linen petticoat. The cap is also of linen, and tied 'round with a silk ribbon. Pleating the skirt to such a steep point in back pretty much proved too complicated for my lizard brain. 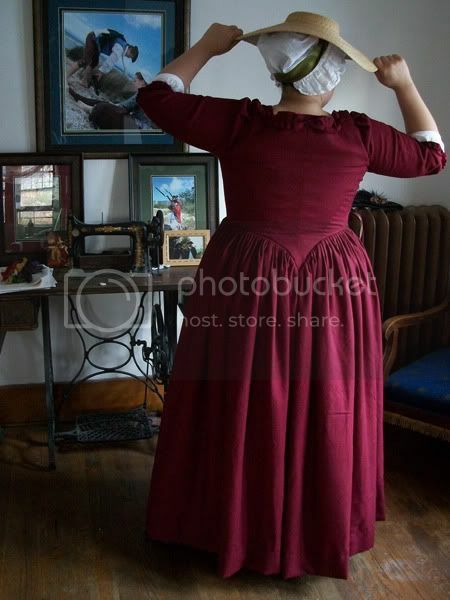 I ended up pressing pleats into the skirt, laying it flat and placing the bodice over it, marking the curve, folding over the excess, and then whipstitching the pre-pleated skirt straight to the waistline of the bodice. I looked for more detailed instructions in the sources I had, but most of them just said things like "Bodice is made up by mounting silk to lining, skirt is attached." Not helpful. The neckline and cuffs are trimmed with ruchings of self-fabric, based on a dress in Nancy Bradfield's Costume in Detail. The edges are pinked in scallops and the ruching was sewn straight to the bodice. The bodice closes down the center front with straight pins, which was a common closure method in this period. 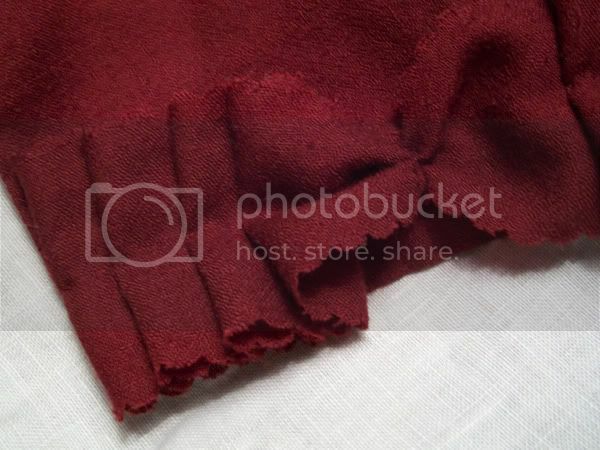 The front point likes to flip up, but that's solvable...just pin it to the petticoat! 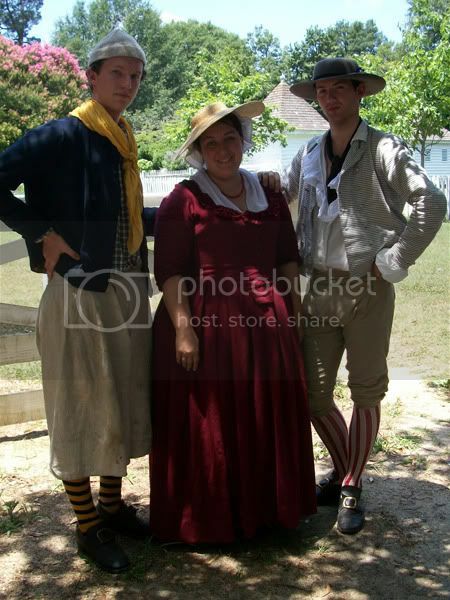 The wool was so light that it pleated down quite small; the petticoat is three panels of the wool's full width--about 54"--and there's surprisingly little bulk at the waist. My green linen roundgown has the same width of skirt, but is much heavier to wear just because the linen weighs so much more. 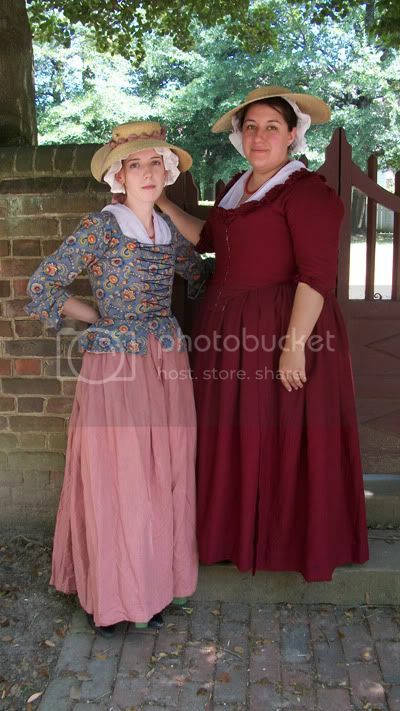 This dress, on the other hand, is quite light and comfortable; in fact, despite the fact that it's wool and we had heat indices of up to 110 at Under the Redcoat, it was my most comfortable outfit all weekend!